I missed out on far too much at school but it wasn’t my fault. However, I had been given this voice of mine, of which it seems, everybody loves. My act is one that is very close to the simple natures of a river flow. Music softens the blows of life, every time. Music is the food of Love and Peace. John Lennon preached this, time and time again. Music can work wonders for everyone. Incredibly ‘gifted people’ came out from nowhere, and produced a musical waterfall of love, Elvis Presley, Frank Sinatra, Bee-Gees, Stevie Wonder, Michael Jackson, Amy Winehouse, Luciano Pavarotti, just to name. They poured sunshine all over the world. Yes, of course, they had the top business people behind them too but you have got to have an unbelievable wealth of talent and staying power for that to happen. There are many musso’s and Singers out there like me who would love to have that. They are a special kind of person. My spiritual side, my guide within me, is an American Indian. I have known this for a very long time. So I wanted to know everything about the American Indian and especially for some reason – Cherokee and the Indian history. The original Americans, their horror, their spiritual world and their betrayal. My next trail, thanks to the Musical Express, took me to Lido Di Ostia near Rome, in Italy. Another fund fueling project. There were 2 owners of this next project. Marino M. and Joel F. Marino a brilliant lead guitarist in his own right and Joel, once a famous boy actor. He was in one memorable french film, whereby Maurice Chevalier and Leslie Caron were the main stars. Joel, is a musical computer whizz and has rich Operatic parents. Marino and Joel had rented an entire top floor unit in a large building down by the coast of Ostia, a small seaside town. They were of Swiss and French origin. It was ‘much cheaper to come to Italy to work on an album, rehearse it and record it in Ostia than France or Switzerland. But on top of that, it meant they could also cover their tracks – no one actually knew where they came from, with no knowledge of where they actually lived. This I learned later on. There was certainly a lot of money invested in their project. Again, my voice was chosen out of 88 contenders. Again, the project was already owned but lyrically some songs needed the English touch, along with some melodies. “Here I go again” – Though this time, it looked very promising! There were girls, girls, girls everywhere. The 2 guys were good looking and loaded. Cool! But I realized, there was another reason for all this activity. Drugs were here – apparently the best cocaine. So they were up one minute and in a bad place the next. They use to fight like cat and dog, screaming at each other for one thing or another. It was a very volatile situation a lot of the time. But I was given my own room in which to work and did not get involved in their pursuit of highs. Marino was a black belt and had a short fuse. Often Marino had Joel by the throat and had lifted him off the floor, against the wall, screaming at him. Why they never got married, I’ll never know. I had no idea why or how I managed to get through the 5 months I was working with them. But having said that, they were always cool with me. Marino told me that when the album was complete, he would change the contract adding me to percentages for my work on changing and lifting much of the album. But all I could do at the time was take his word. So every change I made, to whatever song, I copy-wrote. Then, I sent the changes home, registered mail. They flew me over in the beginning but told me it was a one way flight, simply because they did not know how much time this album was going to take to finish. But nearer to the time, a break was being considered for everyone before going to Germany to sign the deal. So they would book my flight back when it came to that point. They assured me of their wealthy background. Well, I worked hard on that album, but I also had time out and enjoyed being out in the sun and heat. We were never without food. 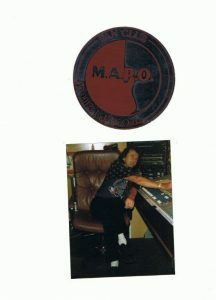 The recording at the studio in Rome had been booked well in advance- it was very clean and spacious. But laying down some of the tracks in timing details, along with samplers and pre-recorded sections, was stressful indeed.